“I’ll blow your damn brains out, you punk.” That’s what Elvis Presley told a young marine on March 23, 1957. At least that’s what 18-year-old PFC Hershel Nixon alleged Elvis said as the rock ’n’ roller pointed what looked like a 25-caliber pistol at the marine. Presley denied he made the comment, and the gun turned out to a “toy.” Although no charges were filed, and both men later apologized to each other, the incident made national news. 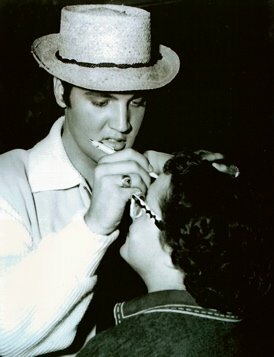 The episode with the marine only increased the public perception that Presley was as reckless on the streets as he was on stage. 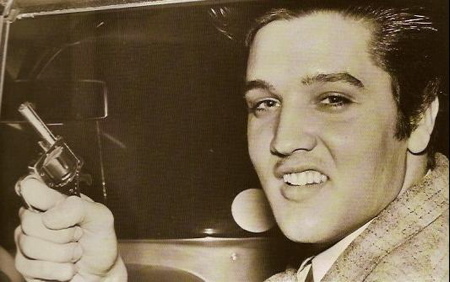 It was an image that fueled his young fans’ adulation and added to the conviction of community leaders that Elvis had a harmful influence on teenagers. Elvis no doubt thought that his telegram would end the matter, but Private Nixon’s marine superiors at Millington Naval Air Station in St. Louis, where Nixon was undergoing training, wanted a more formal conclusion. They requested a private meeting between Presley and Nixon to resolve the situation. So, on Tuesday, March 26, 1957, the two men met with City Judge Beverly Boushe in his chambers at the Memphis Police Station. While the meeting took place, reporters waited in an adjoining room. 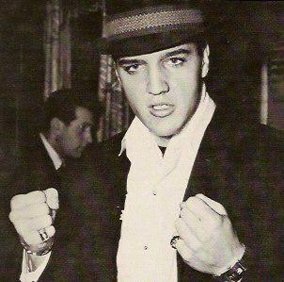 "The episode with the marine only increased the public perception that Presley was as reckless on the streets as he was on stage."